Science and Engineering Indicators (SEI), published by the National Science Board, provides a broad base of quantitative information on the United States of America and international science and engineering enterprise. Indicators are quantitative representations that might reasonably be thought to provide summary information bearing on the scope, quality, and vitality of the science and engineering enterprise. The indicators reported in SEI are intended to contribute to an understanding of the current environment and to inform the development of future policies. 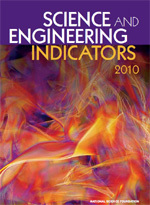 SEI is used by readers who hold a variety of views about which indicators are most significant. SEI is prepared by the National Science Foundation’s Division of Science Resources Statistics under the guidance of the National Science Board. It is subject to extensive review by outside experts, interested federal agencies, Board members, and NSF internal reviewers for accuracy, coverage, and balance. OCC recommends the reading of the chapter relating public perception: Science and technology: public attitudes and understanding.